It’s hard to quantify this book. There were parts that I loved, parts I hated. A novel that makes you run the gamut of these emotions, however, is probably a good one. 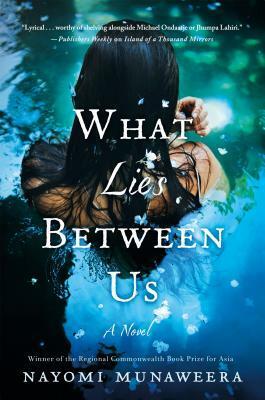 “What Lies Between Us” is the story of an unnamed narrator’s (we don’t know her name until the very end) journey from childhood to a prison cell, where we meet her for the first time. The novel is split into five parts–the first is the narrator’s comfortable life as a child of privilege in Sri Lanka, the second part is how she adjusts upon arriving in America. The last three parts deal with her adult life and the events that led to her shocking crime. I won’t lie to you, now…the beginning of this book started off s-l-o-w. Once it did get interesting, though, I could not stop reading this book. The writing here is spectacular. Ms. Munaweera can definitely move you with words, and in that regard this book didn’t disappoint. 4.5 stars because there were some passages that could have been taken out, because they didn’t really propel the story forward. I won’t fuss too much about it though, this was a uncorrected/galley copy and it will probably undergo a final edit before publication. But…I would definitely like to check out this author’s other novel. Ms. Munaweera is an author to watch.